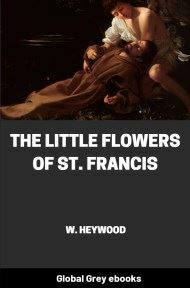 The Little Flowers is a traditional collection of tales of St. Francis, divided into 53 short chapters, which was composed at the end of the 14th century. 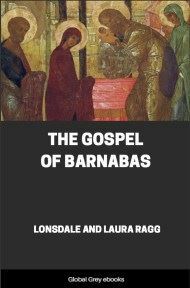 It relates many colourful anecdotes, miracles and pious examples from the lives of Francis and his followers (such as Brother Juniper). 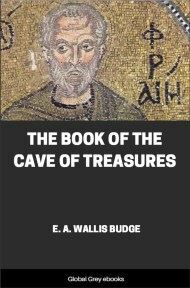 Also includes: Of the Most Holy Stigmata of St. Francis; The Life of Friar Juniper; The Life of Friar Giles, the Companion of St. Francis; Teachings and Sayings of Friar Giles; and, Addenda Taken From the Manuscripts. I. ST. FRANCIS OF ASSISI FRANCIS, son of Peter Bernardone, a wealthy cloth merchant, was born at Assisi in or about the year 1182 during the absence of his father on business in France. From his mother he had received the name of John, but his father on his return changed it to Francis (Francesco, i.e., Frenchman), by which name he was ever afterwards called. Of his mother, whose name was Pica, scarcely anything is known. It is probable that she was of higher social standing than her husband, and certain that Francis was much more in sympathy with her than with his harsh, close-fisted father. Francis was taught some Latin, and also acquired a knowledge of French; and the Chansons de Geste fired his mind with a love of chivalrous adventure. He also learnt to write; but was not at any time a ready penman, and generally resorted to dictation. When he grew up he was put to his father's trade. Of a singularly genial, open-handed disposition, he was "given to sports and singing, going about Assisi by day and night with young fellows like himself". Indeed his extravagance, both in personal indulgence and in giving to the needy, made him conspicuous in the town and neighbourhood. In 1202, Perugia having declared war against its smaller neighbour Assisi, a battle was fought in which Francis was taken prisoner, and he remained in captivity for about a year. Not long after his return he had a serious illness, by which he was first led to turn his thoughts to a change of life. The process of his conversion was slow, and it was a good two years before his path was made plain before him. This period was marked by several well-known incidents. Still thirsting for worldly renown, Francis had made costly preparations for joining a military expedition to Apulia, but had not proceeded farther than to Spoleto when he was turned back by a vision. Again, one night after a banquet, as he and his comrades were going through the town singing, he suddenly fell into an ecstasy and stayed behind, and in answer to the mocking inquiry "What he was thinking of?" and "Whether he was thinking of taking a wife?" he made the significant reply: "You have said the truth, for I have thought to take a bride nobler, richer and fairer than you ever saw." The incident of his changing clothes with a beggar and asking alms in French on the steps of St. Peter's at Rome also belongs to this period. His mental state at this time is thus described: "It repented him that he had so grievously sinned, nor could he take pleasure either in the past or in the present: for he had not yet received assurance that he would refrain from sin in the future" (Legenda Trium Sociorum, 12). The following passage tells us in his own words how he was put on the right track: "It was thus that the Lord granted to me Brother Francis to begin repentance: for while I was in sin it seemed to me exceeding bitter to look upon lepers; but the Lord brought me among them and I showed them kindness. And as I withdrew from them, that which had seemed to me bitter was turned to sweetness of soul and body. And not long after I came out from the world" (Opuscula S. Francisci, p. 77, ed. Quaracchi). About this time, while he was praying in the little ruinous church of St. Damian, by Assisi, before a painted figure of the Crucified, he heard these words: "Francis, seest thou not that My house is being destroyed? Go, therefore, and repair it for Me." And he, trembling and astonished, said: "Gladly will I do it, O Lord". "From that hour his heart was bruised and melted within him, and ever after he bore the wounds of the Lord Jesus in his heart, as clearly appeared afterwards by the wondrous renewing of them in his body" (Legenda Trium Sociorum, 14). The close of the period of his conversion is marked by the memorable scene before the Bishop of Assisi's palace, when Francis renounced his father and all his possessions, stripped himself naked, and was covered by the Bishop's mantle while Peter Bernardone walked off with his son's clothes. Taking in a literal sense the command to "repair God's house," Francis went to live with the priest of St. Damian, and began to beg in the city for stones (which he carried on his shoulders) for the reparation of the church; withal "praising God and uttering simple words in fervour of spirit," so that some mocked at him for a madman, and others were moved to tears of compassion. Now, too, he began the wooing of Lady Poverty, and set himself to live on the scraps of food which he could beg from door to door. At first he looked with loathing at the food he gathered in this way; but he conquered himself and at last preferred such fare to any dainties. By the year 1208 the repair of St. Damian was finished, and Francis set about repairing the little church of S. Maria de Portiuncula (or degli Angeli) below Assisi, which work was completed by the early part of 1209. In this church (probably on 24th February, 5209), hearing in the Gospel for the day the passage Matt. x. 9, 10 ("Provide neither gold nor silver," etc. ), Francis committed it to memory and resolved to fulfil it to the letter. He had been wearing a hermit's dress with a leathern girdle, and shoes, and a staff in his hand. These he discarded, and made himself a single tunic of coarsest stuff, substituting a cord for the girdle, and going barefoot. Forthwith he began to preach repentance, always beginning his address with the greeting "The Lord give you peace"; and soon his first few disciples joined him, giving up all their worldly possessions to the poor (see below, p. 222), and dwelling in hovels round the church of Portiuncula and at Rivo Torto (also in the neighbourhood of Assisi). Before long, when his disciples numbered eleven, Francis determined to obtain the Pope's sanction for his work. 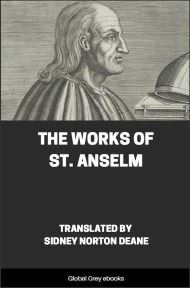 He and his little band of laymen, devoted though they were to the Church, had no locus standi as preachers, and were liable to be confounded with the many sectaries, also professing evangelic poverty, by whom Christendom was infested at this time (see Sabatier, Vie de S. François, c. 3): without the support of the Church's authority his efforts must be sorely hampered. This is his own account of his action: "After that the Lord gave me brethren no one showed me what I ought to do; but the Most High revealed to me that I should live according to the pattern of the Holy Gospel. And I got this written down simply and in few words; and the Lord Pope confirmed it to me" (Opusc., p. 79). This was in 1210; the "Lord Pope" was that Innocent III. before whom the Kings of England and Aragon had grovelled in the dust; his "confirmation" of the rule was verbal only, and in some sort provisional; he authorised Francis and his disciples to preach repentance; blessed them, and caused them all to receive the tonsure, which conferred on them the status of clerks.